Lainston House is a fabulous venue for weddings at any time of year. The grounds are meticulously well kept and include some small ruins. There are amazing gardens on three sides of the venue. The front is a grand and stunning approach for your guests, the back has outstanding views and the side is intimate and sheltered with garden furniture. The interiors are similarly wonderful with the feel of a grand country house. The decor is exquisite and the furnishings are sumptuous. This venue oozes class and historic character. If you love Jane Austen you should really look at this place. The rooms we’ve been in for bridal and groom prep have been fantastic. Stunning interiors with acres of space and glorious soft light from the huge period-design windows. The staff are second to none at Lainston and the whole feel of the place is one of welcome, style, class and comfort. Wedding ceremonies can be held at Lainston either inside, or outside if weather permits. For inside weddings they use the same room for the ceremony, the reception and the dance. It is spacious but intimate with bare-brick walls and timbered ceiling. It is joined to the rest of the hotel by covered corridors. When the room is being turned round the guests go to one of the lovely lounges in the hotel or out into the gardens if weather permits. Lainston House is not far from Winchester and is set in the most amazing countryside with a long sweeping driveway up to the house and car park. Cars are kept away from the front of the house during weddings which is fantastic for photographs. There is ample parking only a short walk away from the main buildings. 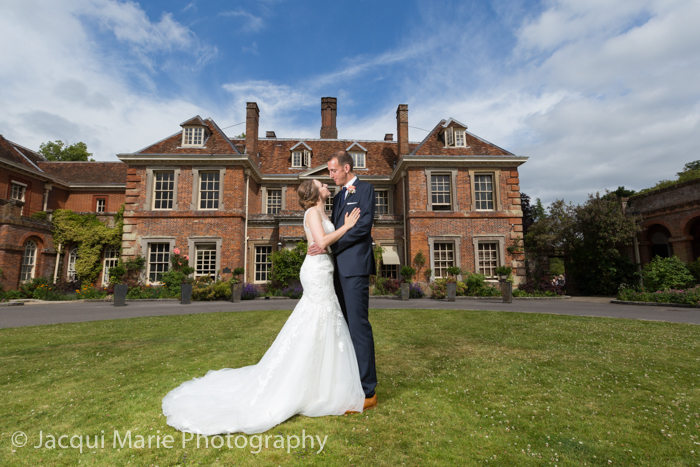 For us, Lainston is a Top Summer Wedding Venue because of its amazing architecture and grounds and Top Winter Wedding Venue because of the amazing interiors with plenty of light and space. Even if there has been rain before the wedding day leaving grass muddy and soft, there are plenty of stone-slab patios and paths close to the buildings so the beauty of the grounds can be enjoyed without venturing onto muddy grass. Lainston is a top class venue with amazing staff and a great feel to the place. There are countless photo-opportunities both inside and out at all times of year and in all weathers. It is definitely worth considering Lainston House as a possibility for your wedding venue. Rivervale is a fabulous venue for weddings at any time of year. The grounds are meticulously kept and are beautifully landscaped and include a well kept pond, ideal for reflection photographs. The interiors of the barn are similarly wonderful with an undeniably rustic feel but with such beautiful decor that it has the benefits you’d expect from a high class modern venue - great light with modern fittings and comfort. There is actually two big barns, both have amazing interiors and they are joined by a stunning foyer area. One barn is used for ceremonies and the other for your meal. The foyer is used for your dance. Within the circle of buildings is a courtyard with a Continental in feel. There are chairs and tables for your guests to relax in the sheltered courtyard and drink and chat but there are also some wonderful features useful for great photographic possibilities: a fountain, a pitch-roofed gate, a plant clad two story chalet with external iron spiral staircase and Romeo & Juliet balcony. There is the most amazing Bridal Prep suite of rooms which look out on one side to the fountain in the courtyard and out over the manicured gardens on the other side. These rooms are beautifully fitted and look fantastic but have modern fittings and are very practical. From a Bride Prep point of view the rooms are spacious, well lit, look fantastic with windows and a full length mirror and a bedroom and bathroom. A wonderful place for any bride to start her day. With so many things good to say about the grounds and architecture of Rivervale, it would be all too easy to forget to mention the staff - but they are all quite exceptional. Not only are they well turned out and run things like clockwork silently behind the scenes, but I have never known staff (as a group) to be so aware of what the photographer is doing and whether they would be in the background of the photograph. They are an absolute pleasure to work with. Although Rivervale has the feel a light and space and rustic grandeur, it is so beautifully laid out that there is surprisingly little walking to do. A definite plus for older guests and ladies with big high-heals. There is ample parking at Rivervale and it is set right in the middle of the countryside. For us, Rivervale is a Top Summer Wedding Venue because of its amazing grounds and courtyard, but also a Top Winter Wedding Venue because of its amazing interiors, plenty of light and space inside and a very picturesque courtyard that is both sheltered and is stone floored, ideal for group photographs if the grass is too soft in the garden. 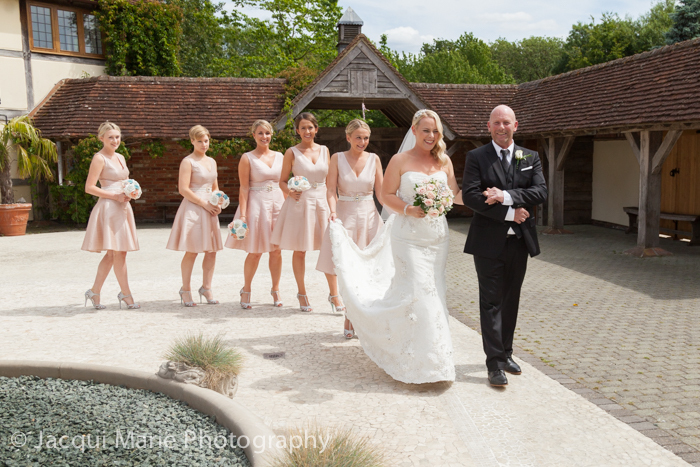 If you want a barn wedding that has the benefits of modern fittings and great staff with great photographic options all the year round, we strongly recommend you have a look at Rivervale.